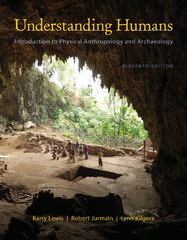 Cengage Advantage Books: Understanding Humans: An Introduction to Physical Anthropology and Archaeology 11 Edition UNDERSTANDING HUMANS: INTRODUCTION TO PHYSICAL ANTHROPOLOGY AND ARCHAEOLOGY shows students how anthropologists and archaeologists go about their work as they study human evolution, living nonhuman primates, human adaptation and variation, the origin and dispersal of modern humans, food production, the first civilizations of the Old and New Worlds, and so much more. Using a biocultural approach, the text balances the presentation of physical anthropology with archaeology and concludes with a new chapter that ties together the material on human biological and cultural adaptation by focusing on lessons learned from our species evolution such as the impact of humans on the environment. Students will also benefit from the new chapter opening learning objectives, "At a Glance" sections that summarize key concepts, and end-of-chapter "Critical Thinking Questions" that help students better understand the material and study more effectively for exams.